Prepare to See the Universe in HD! Astronomical interferometry uses a cost-effective, sparse array of comparatively small mirrors, rather than a single very expensive (and, at some point, impossible-to-produce) large mirror, to achieve high angular resolution observations. At Goddard, we're developing interferometry missions to image and study a wide variety of objects, at wavelengths ranging from the X-ray through the UV and optical and into the infrared. 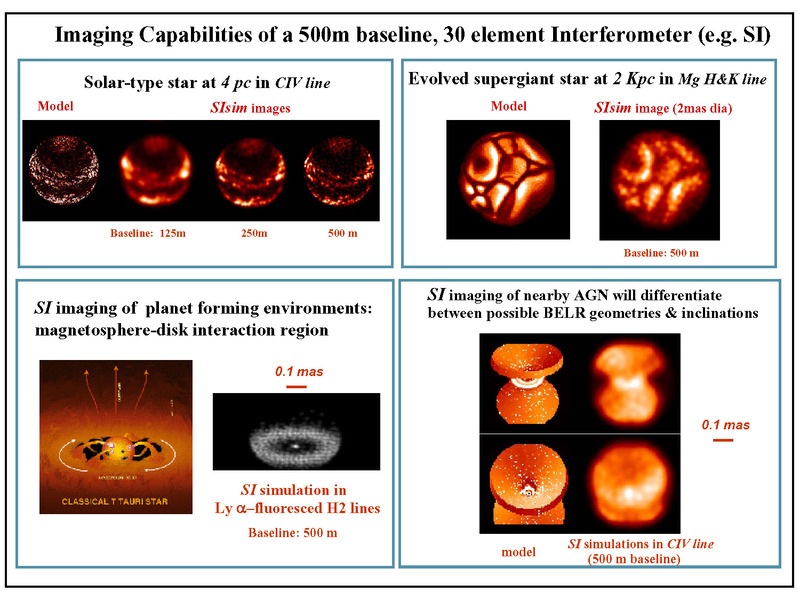 Potential targets include the surfaces of stars, the event horizons of black holes, extrasolar planets, and many other targets of interest. Simulations of Images that can be obtained at 100 milliarcsec resolution using interferometry.